You’re Amazing. And so am I. What happened to the amazing adventures of childhood or college? To launching a plastic inflatable couch into the Red Cedar River on Michigan State’s campus to drift past submerged rusty bicycles, trash and rotting logs only to crawl up its banks laughing with friends as disgusted peers looked at you dragging said couch back to your dorm room and wondering how much toxic sludge you ingested on the voyage. It’s time for a little more amazing in my life and yours. 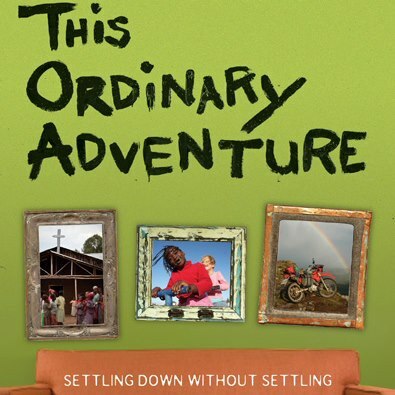 My friends Christine and Adam Jeske have written a gem of a book called This Ordinary Adventure. Yesterday, I sat on my back deck in the beautiful autumn sunlight finishing their book as my son Reuben drew pictures of angry birds next to me. When I closed it and set it down this was what went through my mind. Reading this book feels like having those late night conversations with friends in college about wanting to change the world, cooking up zany ideas, and taking time to reflect on life. It was inspiring to a tired parent to remember that taking time to watch a praying mantis climbing up the clematis vine for a few minutes with my kids can actually be something amazing. It reminded me how easy it is to get caught in the keeping up with the Joneses mentality as I disdainfully survey my mismatched living room furniture and pine for the chic urban living rooms when I surf apartmentherapy.com. It made me laugh at their crazy stories and o remember all the adventures I had with friends in college. I was encouraged that other parents are also inviting their kids into crazy adventures (see their story about playing frisbee in the rain with their three-year old). It made me want to stop to realize that there are a lot more amazing things going on around me and that I can choose to participate, create and enjoy because God has given us an amazing world to live in. So, the Jeske’s have thrown down the amazing days gauntlet in their This Ordinary Adventure: 31 Amazing Days challenge. Want to join us? Now, before you start to tell yourself, “Jessica, c’mon. I’m a busy person how can I have 31 Amazing days? Well, that’s the cool thing about their book. You don’t have to do anything big or fantastic. It can be something as simple as not checking your phone while stopped at a stop light and observing the way the leaves are beginning to change color, to call a friend to go out for coffee instead of surfing Facebook, online shopping or cleaning your house. It could be to let your kids eat ice cream for dinner or to dress up like a 1950’s housewife in a poofy pink dress and serve meatloaf to your family (my roommates and I in college actually did this). Yesterday I cleaned up two dismembered chipmunks that our cat had killed. I wouldn’t say that it was a pleasant experience but I was amazed that my cat could chew off the heads of two chipmunks so that their intestines spilled out all over the grass. I briefly thought about how cool it would be to have a taxidermied chipmunk scene in my house after finding my cat’s kill in our yard. but then I remembered the chipmunks didn’t have heads any more. photo by curious expeditions. I’m going to try and post a blog about this at least once a week, or at least post on their facebook page to share about my amazing day. Leave a comment if you’re in and head on over to their page (Click Here!) to pick up the gauntlet of amazing. Because you are amazing. and so am I. Thanks for writing this, Jess. I’m looking forward to reading your future “Amazing” posts! Also, your mention of dead chipmunks a) makes me laugh imagining the dead chipmunks our outdoor cat likes to catch, b) reminds me of an Amazing evening we spent Friday at a moonlit nature festival across the street at a campground, where our kids got to hold and fondle some actual stuffed chipmunks and other small mammals, and c) reminds me of another Amazing adventure I’ve been meaning to have, which is to go visit the place that I believe your photo is actually taken of. I believe it’s a place in Madison, and if I remember correctly, a friend of ours used to attend a church that met in the same building, and she used to get to go off to Sunday school each week strolling past those displays of dead squirrels dressed in tutus and such. Finally, to give credit where it’s due, the three-year-old in the frisbee games wasn’t ours (our kids were 6 and 8 by then). She was one of three kids in a great family who have become allies in Amazingness–in fact they just biked 6 miles to our house (little ones in tow pedaling short legs like crazy) for a book release party a week ago. Just remembering those little pink smiling faces chugging up our gravel driveway (the littlest ones were in a trailer by then with their little bikes strapped on the trailer) makes me want to get out and do amazing stuff today! yes- I noticed that the restaurant is in Wisconsin! 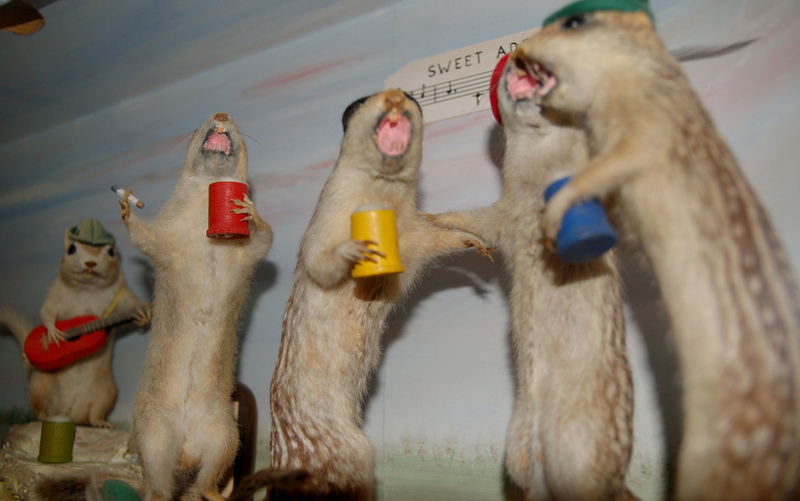 Wow- that would be cool to see taxidermied animals on your way to sunday school 🙂 It seems like quite the kitschy place.